National Nail announces the newly-upgraded 18-gauge STINGER CS150B Cap Stapler with an enhanced design that improves performance with easier loading, longer tool life, and tool-free adjustable exhaust. 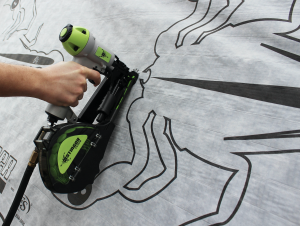 Shooting 200 caps and 200 staples before reloading, the versatile cap stapler now also provides a wider range of operating pressure (up to 120psi) which makes it ideal for installing roofing underlayments, house wrap, and foamboard. The Stinger CS150B shoots 5/8-inch, 7/8-inch, 1-1/4-inch, and 1-1/2-inch length 18-gauge staples with full 1-inch plastic caps. It also includes an installed belt hook, trigger with bumpfire and sequential modes, and durable carrying case.